Description: This native perennial plant is 2-4' tall. It is either unbranched or sparingly branched toward the apex. The central stem is green or reddish brown; it has scattered short white hairs that are quite stiff, providing a sandpapery texture. 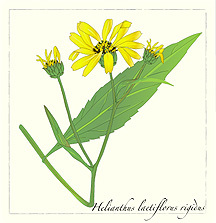 The opposite leaves are up to 6" long and 2" across, becoming slightly smaller and more narrow as they ascend the stem. However, one or two of the uppermost leaves may alternate along the stem. These leaves are lanceolate or narrowly ovate, tapering gradually at the base. They have short thick petioles, smooth or slightly serrate margins, and a rather rough texture because of scattered short stiff hairs and fine bumps on the surface. In hot dry weather, the leaves often curl upward along the central vein. Each composite flower is about 21⁄2–4" across, and occurs singly at the apex of the central stem. It consists of 10-25 yellow ray florets surrounding numerous reddish brown or yellow disk florets. Sometimes the ray florets fold along their length and assume a star-like quality in response to hot dry weather. There is no noticeable floral scent. The blooming period occurs from late summer to fall, and lasts 1-2 months. The root system produces numerous rhizomes, which enables this plant to form dense colonies quickly. These colonies of Prairie Sunflower tend to exclude other plant species because the roots exude allelopathic chemicals that inhibit seed germination and growth of young plants. Because Prairie Sunflower is somewhat vulnerable to these chemicals itself, the plants in the middle of a colony sometimes die out, creating a "fairy ring" effect. Cultivation: The preference is full sun and mesic to dry conditions. The soil can contain significant amounts of loam, clay loam, sand, or gravelly material. This plant is easy to grow, but can spread and become very aggressive. Patches of powdery mildew may occur on the leaves. It is sometimes shy to flower. Range & Habitat: Prairie Sunflower occurs occasionally in central and northern Illinois, but is uncommon or absent in many areas of southern Illinois. It is locally common in some prairie remnants, particularly along railroads. Habitats include mesic to dry black soil prairies, gravel prairies, sand prairies, hill prairies, limestone glades, and areas along railroads. Faunal Associations: The flowers attract bumblebees, Miner bees, large Leaf-Cutting bees, Halictine bees, bee flies, butterflies, and skippers. Typical butterfly visitors include Phyciodes tharos (Pearl Crescent), Vanessa cardui (Painted Lady), and Chlosyne spp. (Checkerspots). These insects seek nectar, although the bees also collect pollen. The caterpillars of the butterflies Chlosyne nycteis (Silvery Checkerspot), Chlosyne gorgone (Gorgon Checkerspot), and Vanessa cardui (Painted Lady) feed on the foliage of this and other sunflowers. The caterpillars of several species of moths and miscellaneous other insects feed on various parts of sunflowers (see Insect Table). This includes the larvae of Microrhapala cyanea (Leaf Miner Beetle) and Gnorimoschema sp. (Gall Moth sp. ), the latter forming circular galls on the stems. The large and nutritious seeds are eaten by many kinds of upland gamebirds, songbirds, and small rodents (see Wildlife Table). The Eastern Pocket Gopher eats the roots, while deer and livestock browse on the foliage.